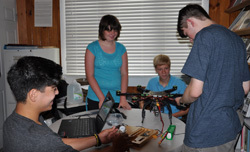 Each year, regional finalist teams are invited to apply for the STEM-In-Action grant for funds to implement their eCYBERMISSION project solutions in their community. These awards are independent of the selection of eCYBERMISSION national finalists. The AEOP STEM-In-Action Grant will be awarded to five teams selected by judges based on the evaluation of the teams' proposed implementation plans. Each of the five selected teams will receive an award of up to $5,000 and will be invited to the National Judging & Educational Event in June. Evaluation of STEM-In-Action awards will remain separate from the teams' overall project scores. The grants will be awarded across all grades to the teams whose implementation plans prove that their projects provide the greatest possible impact within their communities. A team does not have to be a national finalist team for this grant opportunity. It is open to any regional finalist team. All eCYBERMISSION regional finalist teams will be permitted to expand their proposed community benefits, which then become your implementation plan. This optional activity enables teams to develop a concrete plan to further develop their project into a mature and scalable solution, and effectively implement these solutions into their local communities. Students are encouraged to closely work with a U.S. Army Scientist or Engineer CyberGuide when creating their implementation plan. Take a look at what previous STEM-In-Action grant winners are up to! Read about Team Power Play and their work on playground equipment that generates electricity! Read about Styro-Filter and the water filter they are developing! Take a look at SPOT-R in the news! Interested in HOW the judges will evaluate your submission? Check out the rubric they use!